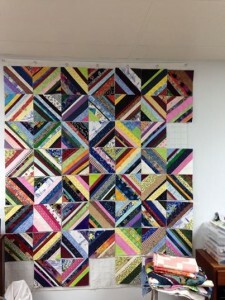 I’ve been working on a box of scraps I have in my studio, I have two quilts pieced and the box is still full of scraps. I don’t know why it doesn’t empty, it appears to reproduces when I’m not looking! We have a few snow days coming so that will keep me home and perhaps I’ll make a dent in that scrap box. I’ve been teaching seniors how to quilt at the Tracadie Community Centre and they are keeping me on my toes, they are funny and a very creative bunch of ladies. I will post pics at the end of the programs to show you how well they did. They will be hand quilting their projects, yes I know I am a longarm quilter and have a studio and haven’t hand quilted anything in the last 10 years but that’s the way they want to learn, so I have to dust of my needles. Did I mention I love Snow Days! I love the quietness of winter. Its so calm and relaxing, but of course I work from home so I don’t have to drive the icy roads. I feel more creative in the colder months than any other time. From our Home to Yours, We would like to wish you a very Merry Christmas and all the Best in the New Year!